Our adventure started by spending a night at the Golden Nugget in Las Vegas. We rented a car and headed out the next morning to go stay in a little city called Peach Springs, Arizona. It is literally in the middle of nowhere. We had no cell signal or Wi-Fi. This is the closest town that you can stay in to get to the start of the trail head. Keep in mind there are only two hotels here. From our hotel, we still had an hour and a half drive to the start of the trail head. We woke up at 2am, packed up, and headed out to achieve the hike of a lifetime. On our way we saw tons of jack rabbits and some of the biggest elk you could imagine! It took a bit longer than expected, since we couldn’t drive as fast. By 4:45am we had the car parked and our head lamps ready. The first two miles are all downhill, switch backs. The terrain is sandy mixed with rocks of all sizes with a steep drop off. Once we made it to the bottom, light just started peaking above the canyon. The views were exquisite. I have never seen such a surreal place. It was everything I dreamed of, but more. Towering canyons everywhere you looked. 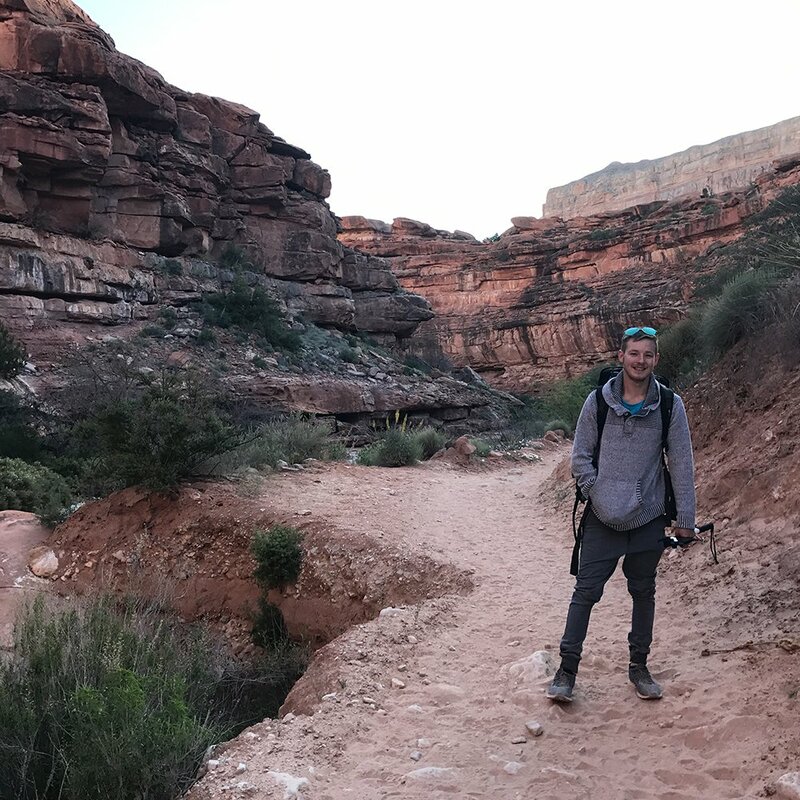 It flattens out after the 2 miles downhill, but you still have 8 miles to go to reach the Supai Village, then another 2 miles to the campsite. 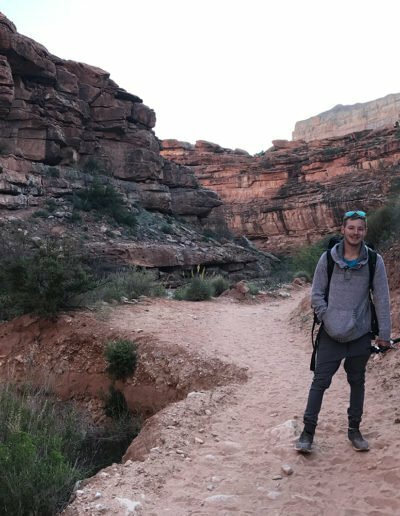 The hike is amazing, weaving in and out of massive canyons with boulders on each side. We were surprised, but we had shade most of our hike. Once we made it to the village, we had to go into the office and check in. They give you an arm band that you have to wear the entire time, and a ticket to put on your tent. You can stock up on food at the grocery store in the village or have a bite to eat at the cafeteria. To our surprise it was pretty reasonably priced, and they had a good variety of foods and products. We took a quick break at the village, but we were eager to get to our campsite, set up, and head off to chase the waterfalls. 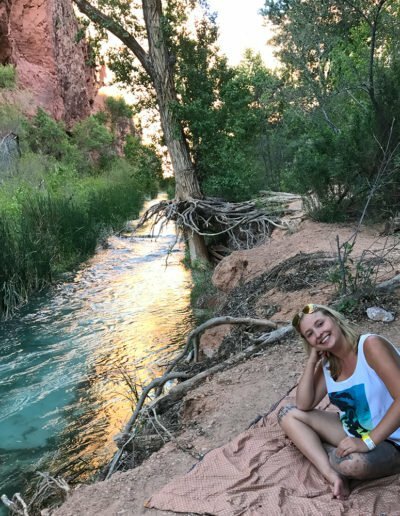 We found the best camping spot in the whole place. 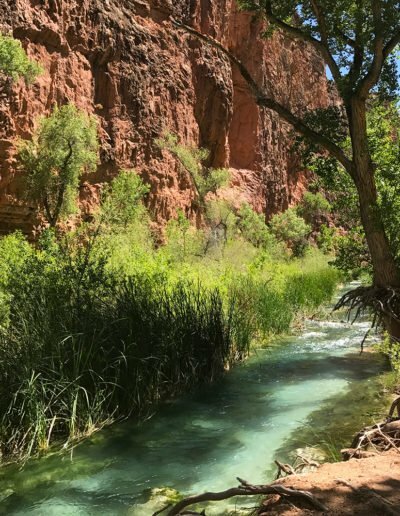 We had a beautiful canyon wall in front of us, with a turquoise blue river flowing beneath. 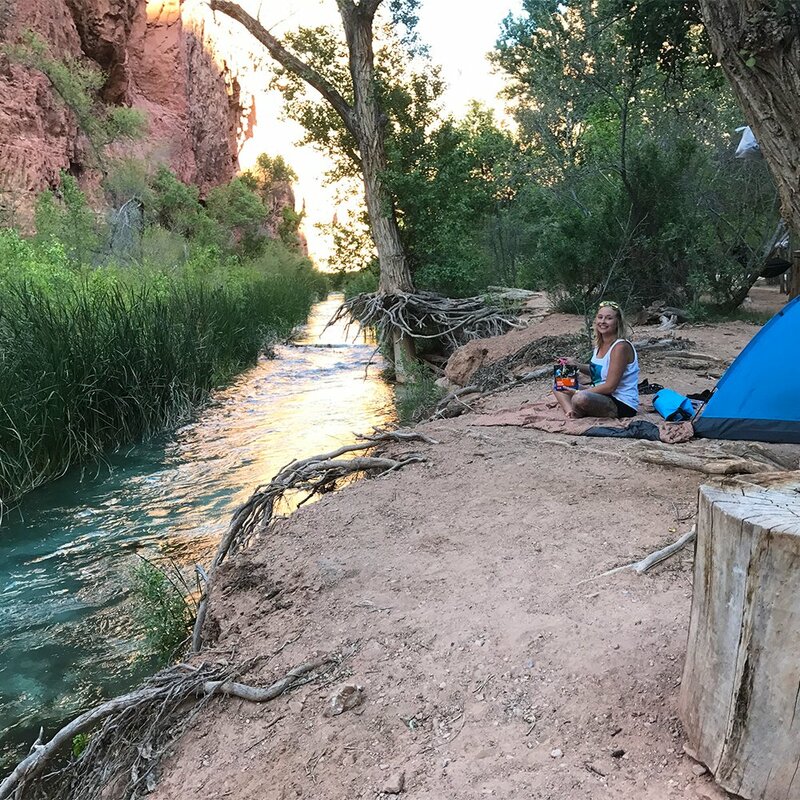 Once we set up camp and made a quick bite to eat (Mountain House Meal), we started our trek to Mooney Falls. 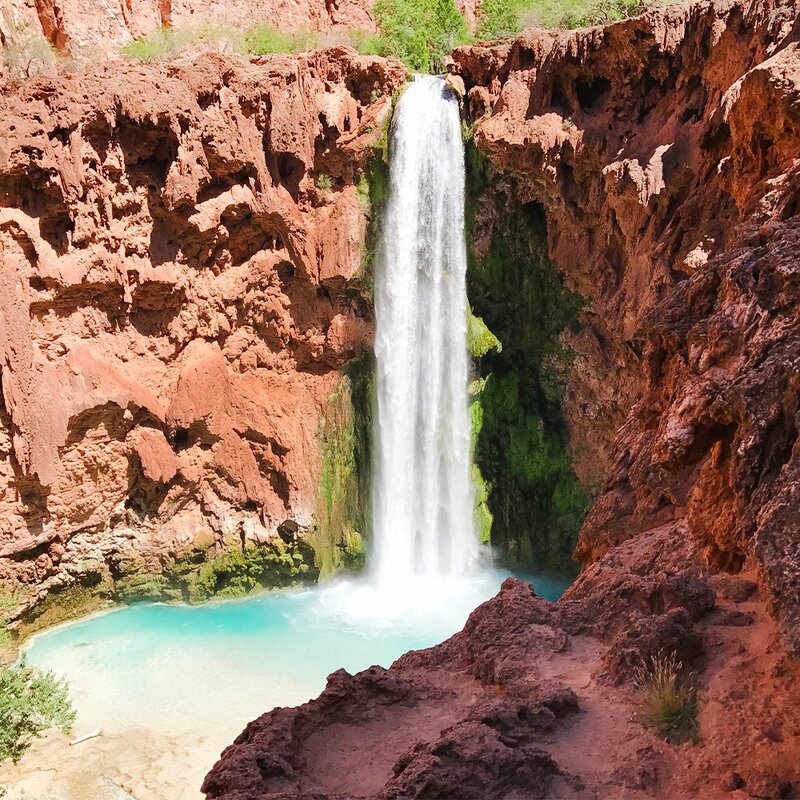 This is the iconic and biggest waterfall of Havasupai. It is higher than Niagara Falls, to put it into perspective. We were both exhausted by this point, but the adrenaline was running thru us. The lookout from above is amazing! The water below is as clear and blue as any place I’ve ever seen. To top it off, there are beautiful red canyon walls towering around you from every side. The next challenge was descending the cliff walls. I hadn’t done as much research as I should have. The only thing I read was that you had to climb down backwards. I didn’t realize that I’d be 100 feet in the air holding on for dear life. We had to climb thru two caves, then turn around backwards and rock climb down the cliff by holding onto metal chains. I got half way down, and was thinking to myself what the hell am I doing? At that point, it’s much too late to turn around. The farther you climb, the wetter and muddier it gets. Half way down the rock climbing part, you get to three sketchy wooden ladders. The rungs on the ladder are about a foot apart, and you are still 20-30 feet in the air. This, for me, was the scariest part. One wrong step is all it takes… Just remember, slow and steady wins the race. Finally, we made it to the bottom! My legs were shaking, and my heart was pumping, and I needed to sit down to just take it all in. I can honestly say it was the scariest, but most rewarding trek, I have ever done. 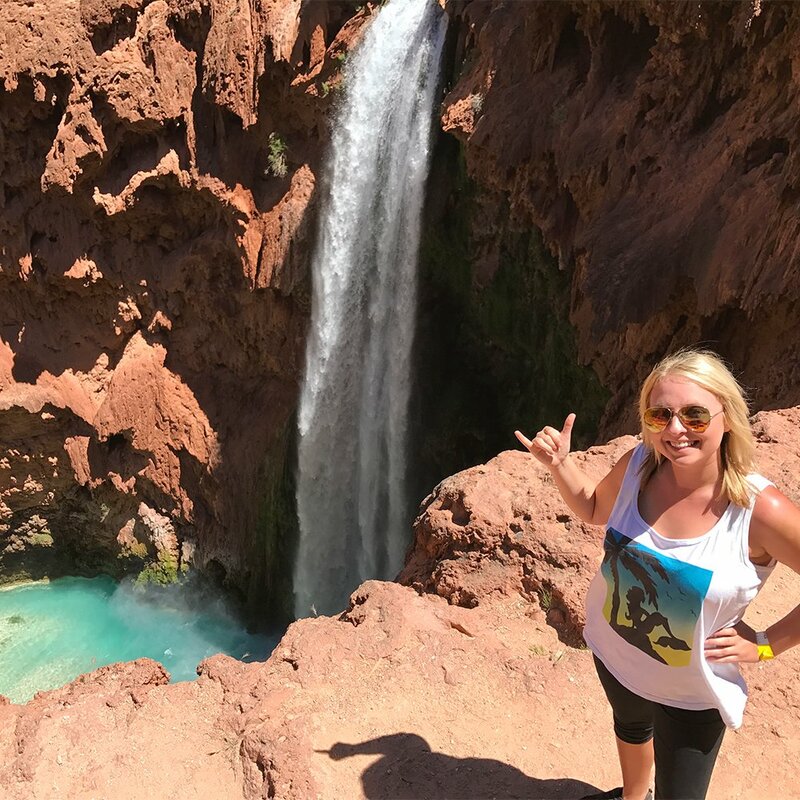 Looking at Mooney Falls from the bottom just was magical. In the back of my mind, I wondered how in the hell I was going to get back up? Once down, you can follow the river another 3 miles to Beaver Falls. Unfortunately, we didn’t have the time or energy to make the trek, but we did explore around the bottom of the waterfall. The water was a bit nippy, but with the sun shining you got used to it pretty fast. After enjoying the view for a bit, we decided to go explore down the river. Some parts were really deep, and others were not. We did have to cross some small waterfalls along the way. Again, I have never seen a more beautiful river in my life. It was crystal clear with lush greenery surrounding you. 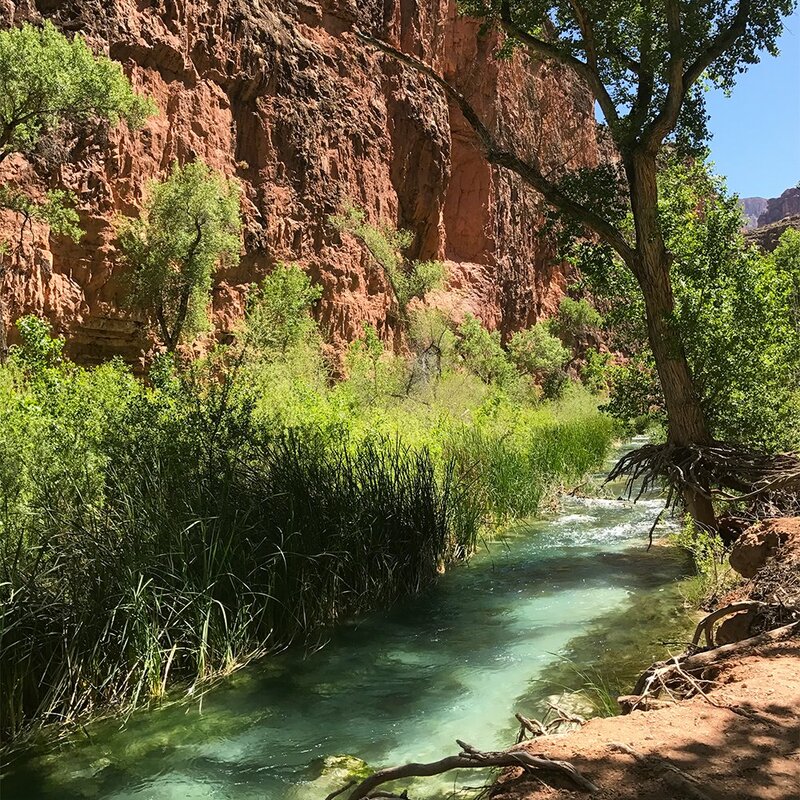 We knew we wanted to go check out Havasu Falls, which you pass going from the village to campsite. 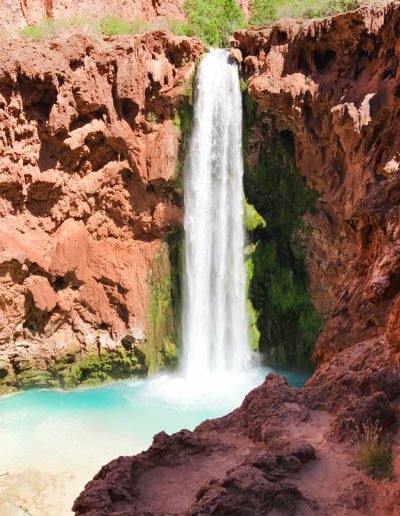 We opted to leave Mooney Falls about 2pm to give us time to stop by the camp, and make it to the next waterfall. Man, I was dreading the climb out, but I did it! 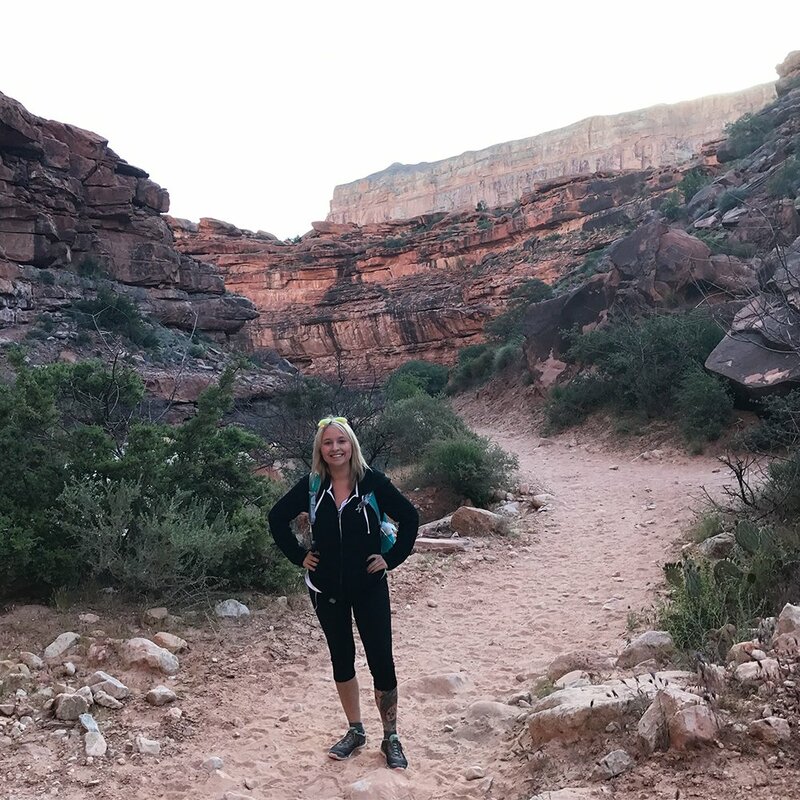 I actually found it easier climbing out than I did in… After stocking up on food and water at the camp, we headed to Havasu Falls. 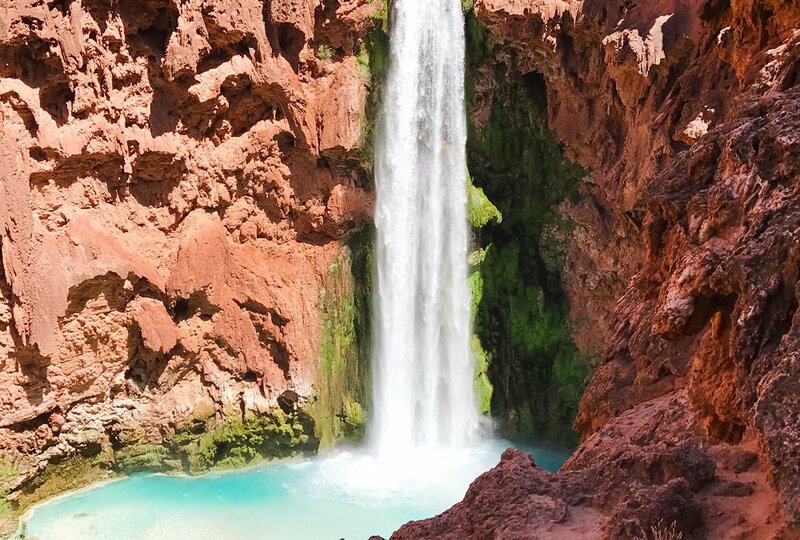 The trek down to this waterfall is a piece of cake compared to Mooney Falls. 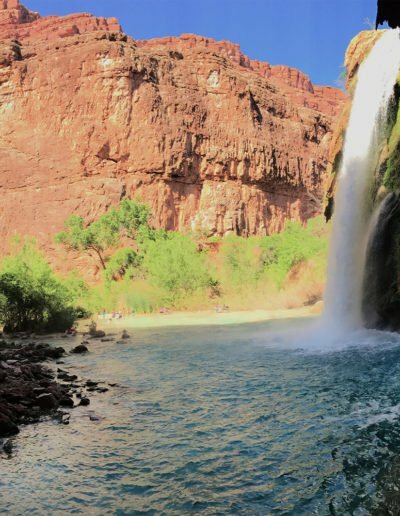 It is basically a smaller version of Mooney Falls, but just as magical. We found a lovely picnic table with spectacular views. We got our mini camp stove and made yummy lasagna for dinner. Who doesn’t love dinner with amazing views?!? 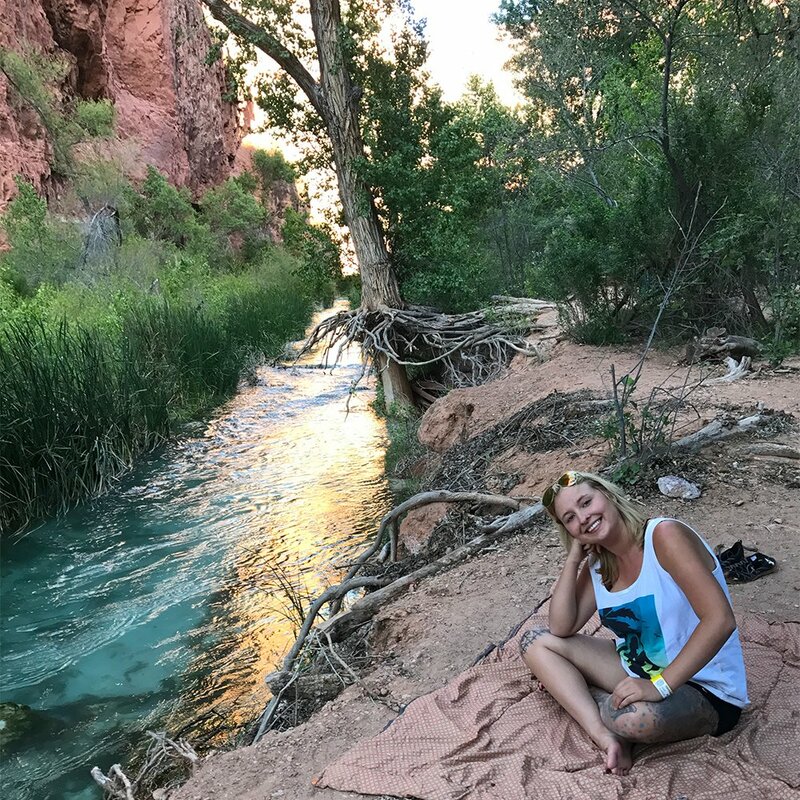 We spent the rest of the evening exploring around Havasu Falls. Around 7:30pm we headed back to the campsite before night fall. Our tent was all set up for a well-deserved sleep. By that point we had trekked roughly 17 miles. We knew if we wanted a chance at catching the helicopter out of the canyon, we’d have to be up by 4am to make the 2-mile trek back to the village. 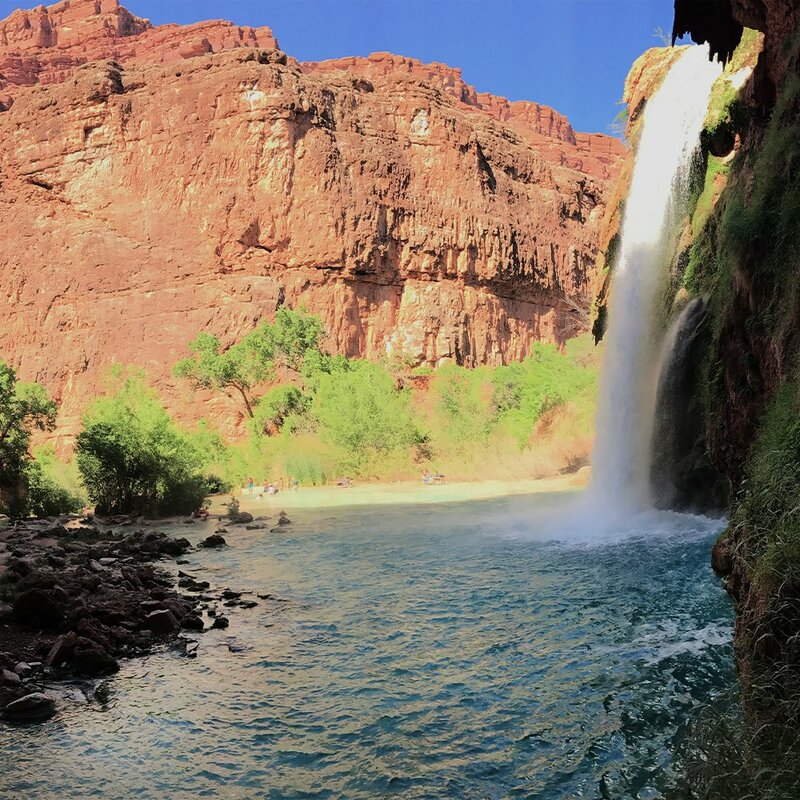 I loved the fact that I got to fall asleep under the Grand Canyon stars, with the lovely sound of flowing water. Surprisingly, we slept very well. At 4:30am we started our hike back to the village. Our plan was to be one of the first 20 people to arrive at the helicopter. If not, we were going to keep hiking the remaining 10 miles. At this point, we were praying for the helicopter. Also, no one mentioned before the hike, that the 2 miles from the camp ground to the village was ALL uphill. Our muscles were feeling it. I felt like I was on the Amazing Race trying to beat everyone to the finish line. We ended up at the village around 5:45am and were the SECOND in line for the helicopter. Success! The only down side was we had to wait almost 5 hours. I will admit it was the best $85 (per person) we spent this trip. 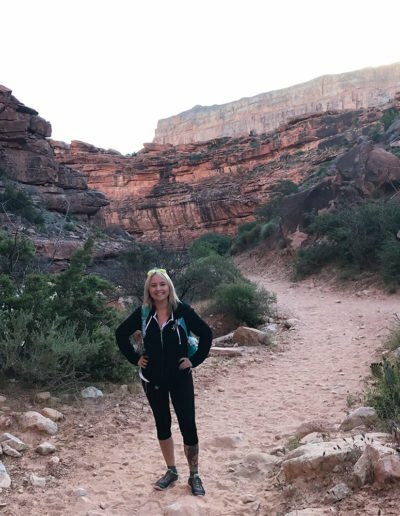 I had never flown in a helicopter and had always dreamed of getting to fly over the Grand Canyon. Killed two birds with one stone. This trip I was able to mark a lot of things off my bucket list. It was a trip I dreamed of and felt so accomplished after doing so. It’s a place you have to see with your own eyes. It takes a lot of preparation, energy, and time but was worth every penny and every minute spent planning this journey. You MUST have a permit. No day hiking is allowed. They start reservations February 2nd of each year, and it usually books up in the first couple of days. We got stopped two different times by the rangers asking our names to confirm we had a reservation. For one night (2 people) the cost this year was $188! Not the cheapest camping, but 10000% worth it!!! They do have a lodge you can stay at, but it also books up very quickly. If you don’t want to be hiking in the heat of the day, I’d recommend leaving the trail head by 4-5am. 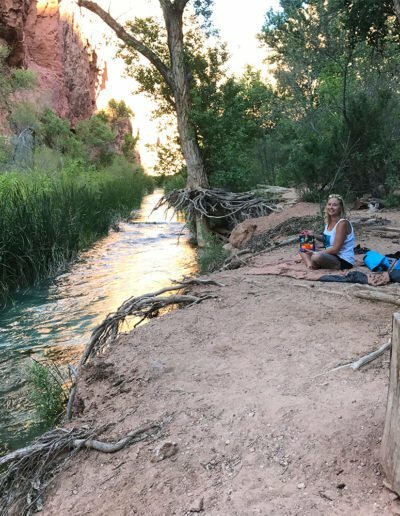 Take water and photo breaks along the way. Watch out for the horses and mules. They come charging, with little to no warning, unless you listen for them. We heard about one girl getting bumped by one because she had her headphones in. 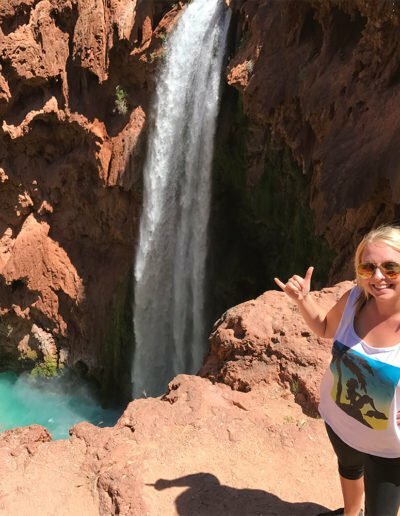 DO NOT climb to Mooney Falls if you are super afraid of heights, in flip flops, or not going to have the strength to crawl back up. Also, going down backwards is the easiest. Hang your food in a tree. We met heaps of people that had their bags chewed thru by squirrels. They can even smell the dehydrated meals if they are left in your bag. Remember that no camp fires are allowed, so bring a small portable stove. Our $5 Walmart one with fire starters worked fine. There IS toilet paper, but it’s always best to have some with you, just in case. There is a natural spring at the camp ground that you can refill your water bottles at. It is safe to drink. BRING WATER SHOES! This made it so much easier, since some places are rocky. Also, I highly recommend wearing wool socks for the trek. Lastly, take a deep breath and be present in the moment. It’s a once in a lifetime experience. It’s not for the faint of heart, but a magical, breathtaking experience none the less.